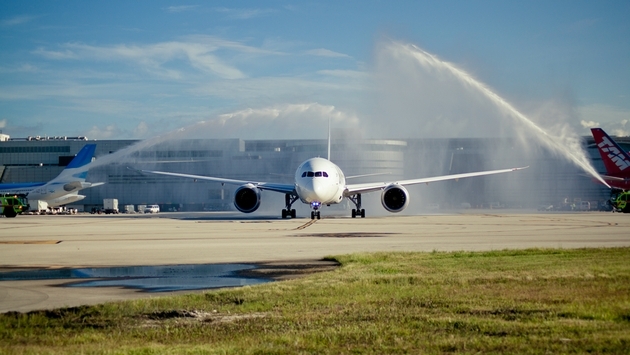 On Saturday, Aug. 9 LAN Airlines inaugurated 787 Dreamliner service at Miami International Airport (MIA). The LAN 787 will operate daily nonstop flights on the airline’s existing Miami to Santiago, Chile route. LAN was the first airline in the Americas to receive the 787 and is now the first carrier to offer 787 flights from MIA. “The Dreamliner was designed to bring back the magical feeling of awe that many of us felt as kids when we were first introduced to flying onboard an airplane”, said Pablo Chiozza, Senior Vice President, USA, Canada and the Caribbean, LATAM Airlines Group. MIA is a strategic gateway for LATAM Airlines Group, comprised of LAN Airlines and its affiliates and TAM Airlines, in the U.S. with the group transporting over 900,000 passengers per year from Miami to over 114 destinations in South America. In 2014, the group of carriers project to transport over one million passengers from Miami to South America. “We enthusiastically welcome the first Dreamliner flight to Miami-Dade County and congratulate LAN Airlines for this historic milestone,” said Miami-Dade County Mayor Carlos Gimenez. Among the main key differentiators that distinguished the 787 from other aircraft are the cabin’s electronic auto-dimming windows and dynamic lighting which allow for a customized in-flight environment depending on the time of day. In addition, the windows of this aircraft have up to 40 percent more surface area than current aircraft windows, which allow all passengers (in all rows) more visibility during the flight, giving them a better view. The 787 has overhead bins with 30 percent more storage space for carry-on luggage and the aerodynamics of the Boeing 787 incorporate technology that reduces the impact felt by the passenger due to turbulence. In addition, the pressurization of the cabin to a lower altitude (6,000 feet instead of 8,000) results in the reduction of headaches or other symptoms a passenger might experience when flying. The cabin configuration onboard LAN Airlines’ fleet of 787 aircraft is 217 seats in Economy and 30 seats in Premium Business for a total of 247 seats. LAN Airlines will receive 32 total Dreamliners over the next few years resulting from a $4.9 billion order in 2012. The incorporation of this aircraft into the fleet is part of the company’s commitment to maintaining one of the youngest fleets in the world, allowing for reduced environmental impact as well as lower operating costs.